Increased illicit use of opioids, including synthetic opioids such as fentanyl and its analogue carfentanil, is a source of increased risk to responders. Most routine encounters between patients or detainees and EMS or law enforcement do not present a significant threat of toxic exposure. While there are anecdotal reports of public safety personnel being exposed to opioids during operations, they are largely unconfirmed. 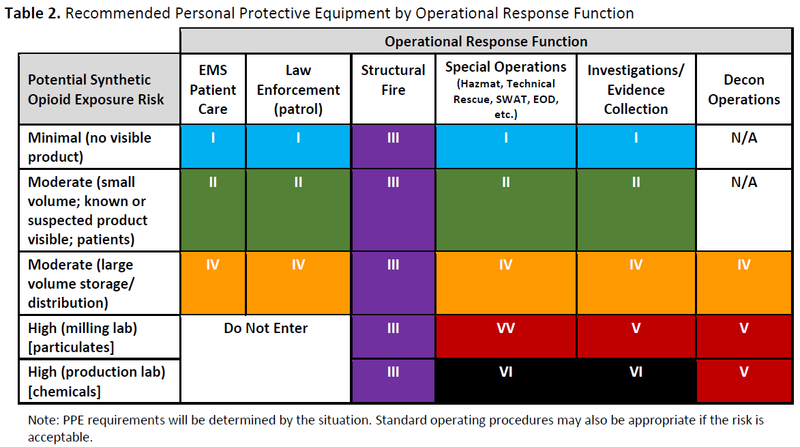 To proactively address the potential risks, this document establishes guidance for personal protective equipment selection and use, decontamination, detection, and medical countermeasures for first responders who may be exposed to opioids in the course of their occupational activities. 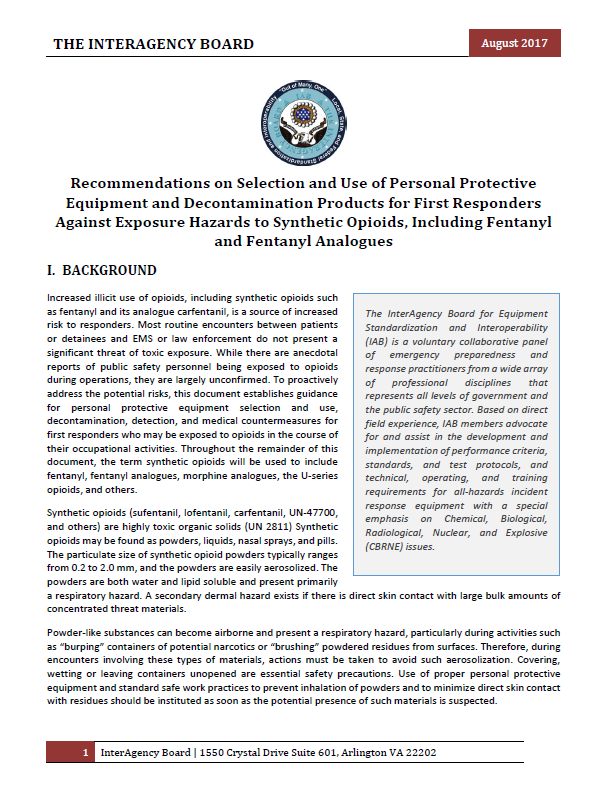 Throughout the remainder of this document, the term synthetic opioids will be used to include fentanyl, fentanyl analogues, morphine analogues, the U-series opioids, and others. Synthetic opioids (sufentanil, lofentanil, carfentanil, UN-47700, and others) are highly toxic organic solids (UN 2811) Synthetic opioids may be found as powders, liquids, nasal sprays, and pills. The particulate size of synthetic opioid powders typically ranges from 0.2 to 2.0 mm, and the powders are easily aerosolized. The powders are both water and lipid soluble and present primarily a respiratory hazard. A secondary dermal hazard exists if there is direct skin contact with large bulk amounts of concentrated threat materials. Powder-like substances can become airborne and present a respiratory hazard, particularly during activities such as “burping” containers of potential narcotics or “brushing” powdered residues from surfaces. Therefore, during encounters involving these types of materials, actions must be taken to avoid such aerosolization. Covering, wetting or leaving containers unopened are essential safety precautions. Use of proper personal protective equipment and standard safe work practices to prevent inhalation of powders and to minimize direct skin contact with residues should be instituted as soon as the potential presence of such materials is suspected. Fentanyl and analogues are water soluble, so expedient decontamination (rinsing) of any contacted areas with water is advisable. Fentanyl in its hydrochloride form (the most common street form) is more soluble than the citrate form (medical grade). Both are more soluble than the free base. Consider adding soap to the wash water to account for the slightly soluble free base. Splashing should be kept to a minimum to avoid aerosolization of the materials. Do not use bleach, alcohol-based solutions, or high pH soaps, as they all may enhance dermal absorption of synthetic opioids.